Streamline and simplify your holiday season with this comprehensive guide filled with quick tips, easy hacks, and fun DIY project ideas—all designed for the most wonderful time of the year! While the holidays are a joyous time to spend with family and friends, we all know they can quickly become a hassle if you’re not prepared. Holiday Hacks gives you expert tips and pointers to celebrate in style—while getting the presents wrapped and sorted, the food beautifully prepared, and the decorations on point—all with a minimum of stress! 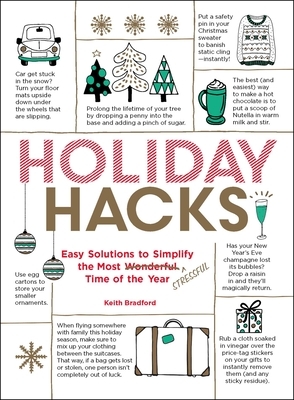 Holiday Hacks includes over 600 handy tips for everything holiday-related—from how to fill your house with a festive cinnamon scent, to soothing those holiday headaches, to an easy and delicious hot chocolate hack using Nutella and milk. There’s even advice about ornament storage—egg cartons are a great way to keep your small and delicate ornaments safe in their yearly hibernation—so you’ll be ready to go when the holidays roll around again next year! Keith Bradford is the sole owner and webmaster of Bradford Media, which publishes 1000LifeHacks.com, YupThatExists.com, and many other blogs/sites. Since its launch at the beginning of 2013, Bradford Media has gained a collective readership of more than 200,000, and continues to grow each and every day. He lives just north of Toronto, Canada in a small suburban town called Aurora, and loves hockey, making music, and reading comic books. "Now, thanks to the new book Holiday Hacks you could keep a condensed, convenient list of effective hacks on-hand all season long." "From decking your halls and shopping for gifts to baking Christmas cookies and traveling home to see family, Holiday Hacks will help you improve every part of the season." "A fun little book full of ideas for making the holiday season easier."